As I am coming into the homestretch here at 35 weeks pregnant I am filled with excitement and wonderment of what this next season in our lives will look like. We have been blessed to have such a fun-filled summer of traveling with family and escaping a lot of our local Phoenix heat. However, as the realization of how quickly this pregnancy has flown by I feel there is so much I'd love to share with you of my journey through this second pregnancy. Mainly focusing on what I have done to keep myself physically active and my weight gain on target. My first pregnancy with Beau felt like the perfect timing when it came to weather. I didn't start really showing until September and was able to stay active outdoors all through the fall/winter until giving birth in January of 2014. This time around, it has been a totally different story and that has come with its challenges. Mainly, it has meant getting creative. Let's not forget too, it's not only having a difference in the season outside, but I have a new season of life with a toddler to chase around. The focus on pregnancy definitely changes after you've already got a little one here to care for. As expectant moms it can feel very difficult to muster the energy to exercise while you are pregnant but the advantages are just too great to allow those excuses, although good as they may be, to win the battle. My journey has not been perfect. I have found myself in slumps of tiredness and excuses many times. However, having a consistent exercise routine has allowed me to stay mentally strong, have more energy throughout the day, sleep better at night and ultimately strengthening my baby's growth and development. I also attribute my fitness level with my first pregnancy to how smoothly my natural labor, delivery and postpartum recovery went. These are the things that keep me motivated. So let's go through some examples of what I have done to keep physically active throughout each trimester of my pregnancy. 1st Trimester: I found out I was pregnant in January this year, right after Beau's 1st birthday. It was a beautiful time of the year so taking walks outside was part of our everyday routine. We are fortunate to live within walking distance to the ASU Research Park which has great walking trails around little ponds so I found that to be our go-to route. I wore my Garmin GPS watch to track my pace and distance and we would walk on average 3.5 - 4 miles each morning as I pushed Beau in the stroller. Then when Beau would go down for his morning nap I would do some free weight and body weight workouts at home. Here is an example of my weekly weight training routine. Also be sure to check out more advantages of working out during your 1st trimester. 2nd Trimester: The weather was still beautiful for most of my second trimester so we continued our morning walks but as this was beginning to get a little dull going to the same place each day I decided we would get a Phoenix Zoo membership. I would take Beau and even if we were meeting people we would often go ahead of the scheduled time and walk the grounds (they do have lots of challenging hills there). This is an example of getting creative and making exercise a fun part of your day. Then when it was time for Beau to go down for a nap I would do my body weight exercises. This was about the time that I started really getting into my at-home workout videos. 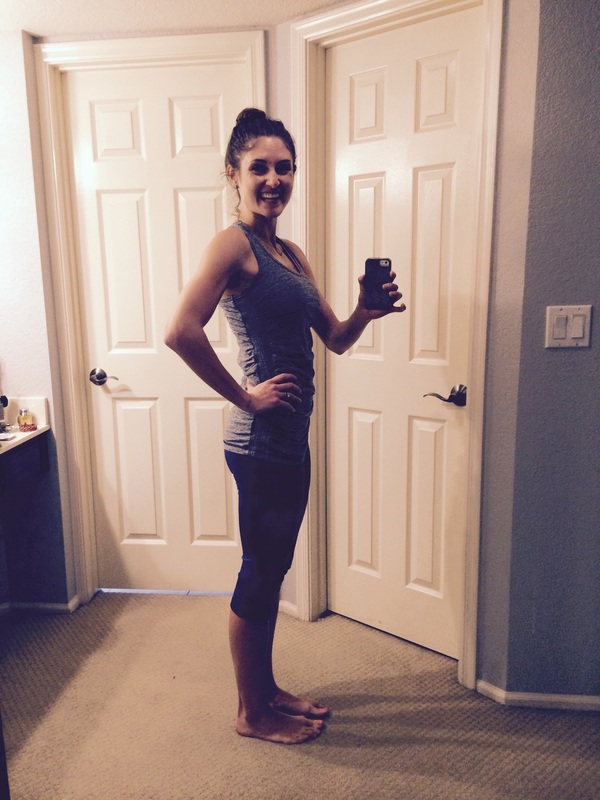 I have loved Suzanne Bowmen's Slim & Toned Prenatal Barre Workout and Leah Sarago's Prenatal Physique videos. When my body felt it was beginning to plateau with the exercise routines I was writing for myself I would change it up with one of these videos. Videos have the added bonus of requiring no brain energy formulating a routine for the day! See more on 2nd Trimester exercise do's and don'ts. 3rd Trimester: This is where the challenge has come in! As we began to travel a lot this summer I had to find ways to continue to exercise outside of my normal routine. I have to admit I actually find I exercise rather consistently when I'm on vacation because there is usually a fitness center available or new sites to be seen. So the locations we did have a fitness center available I would do 30 minutes of cardio, usually walking at an incline on the treadmill and then do a free weight routine. Here is my vacation workout schedule. So what am I complaining about, right? Well, the challenge has been when I am at home in this Phoenix heat that I have to really push myself. These days I am either taking advantage of having a swimming pool by walking laps, or treading water (I am not a great swimmer, so I do not freestyle swim -- but if you can this is a great option!). Another creative solution has been visiting the Chandler Mall in our area that opens for walkers early in the morning. I take Beau and push him around in the stroller while I keep my GPS watch on and track my pace and distance once again. Then it's back to my combo of videos or my own workout routine during naptime for strengthening my muscles. Oh and I shouldn't forget to mention, I always follow my weight training with a good long stretch session. I'll cover more on stretching later. Learn more about 3rd trimester conditions pertaining to exercise. Just remember, you never regret a workout. No matter how long it is. Tell yourself you will spend just 15 minutes exercising and chances are you will want to go for longer and you will feel SO good afterwards. Hope you find encouragement and some new ideas on how to stay physically active during your pregnancy!